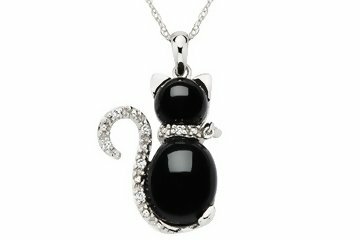 The gorgeous combination of lustrous white gold and inky black onyx is on gorgeous display in this adorable pendant. Oval shaped onyx is beautifully accented with sparkling diamonds and delicately hangs from a white gold chain. A stylish, understated look. ICE Style: PCC_106042. Paw Print Necklace Small Paw Pendant 18k Gold for Dog Lovers and Cat Lovers By Ashley and Co., 16"